Members of Helicopter Maritime Strike Squadron Seven Seven (HSM-77) “Saberhawks” aboard United States carrier USS ABRAHAM LINCOLN (CVN 72) embarked on United Kingdom Royal Fleet Auxiliary Fort Victoria (A387), May 3. 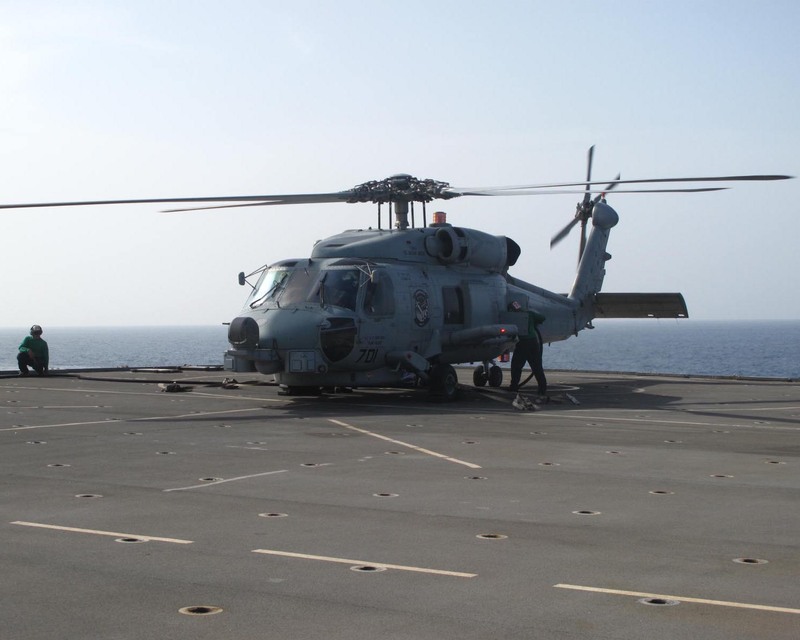 U.S. MH-60R helicopter embarked aboard RFA Fort Victoria. The embarkation, led by Lieutenant Commander Aric “Bull” Edmondson, U.S. Navy, is the first U.S. helicopter detachment to be embarked on a Combined Maritime Forces (CMF) asset in this area of operation, and also the first time on a Royal Fleet Auxiliary. The MH-60R Seahawk is fitted with advanced surface search radar and provides enhanced capability in counter-piracy operations. Fort Victoria is currently flagship for Commander, Combined Task Force (CTF) 151, Royal Thai Navy Rear Admiral Tanin Likitawong and his multi-national battlestaff. This is the first time Fort Victoria has embarked a multi-national task force and this is the first time the Royal Thai Navy has commanded CTF 151. CTF 151 is a multi-national mission-based Task Force, working under the Combined Maritime Forces to conduct counter-piracy operations in the Red Sea, Gulf of Oman, Somali Basin and Arabian Sea.